Today’s guest post is by Chris “RepMan, Jr.” Cody. I’m working on my PhD at the moment and am contemplating what I want to write my dissertation on. My history and a communications background has pointed me toward the subject I have begun to explore: the communication of revolutionary ideas during the recent Arab Spring revolutions. Since the end of World War II, the majority of Middle Eastern nations have been largely under the control of autocrats. With the exception of the 1979 Islamic revolution in Iran, the majority of Middle Eastern populations remained poor and politically apathetic. How and why, then, did revolution spread so quickly and so thoroughly across the entire region in 2011? In my opinion (which many journalists and scholars agree with), technology evolved to the point where the state could no longer control information. The Internet, social media platforms, and smartphones all became pervasive in the Middle East by 2010. One example will suffice: Hosni Mubarak of Egypt was brought down by a revolution that was sparked by Egyptian millennials who deployed these technologies for revolutionary purposes. The Tahrir Square protest on January 25, 2011 (the first of the eighteen days that swept Mubarak from Power) was planned by a twenty eight year old Egyptian who created a Facebook event for it entitled “The Day of Rage.” YouTube videos of state police beating protestors galvanized more support for the revolutionaries. Egyptians tweeted their dissatisfaction with the status quo. Protestors armed with smartphones documented the revolution with pictures or videos they could post directly to social media sites. They could text or message to coordinate collective actions. Yet, one of my favorite writers, Malcolm Gladwell, would not agree with me. He argued in a 2011 New Yorker article that the “least interesting fact” about the Egyptian uprising was that some of the protesters employed new Internet technologies as tools to communicate and organize. He contends that people with grievances have always found ways to communicate with each other during times of civil strife. Gladwell suggested that how they chose to communicate about the political situation was less important than why they were driven to do so in the first place. Sorry Malcolm, but I disagree. Average Egyptians had been oppressed and exploited by successive dictatorships ever since the 1952 coup that dethroned King Farouk. Therefore, it would stand to reason that they should have rebelled decades earlier. The reason they did not is because they lived in an information vacuum where every fellow citizen could be a potential state informant. The technologies available in 2010 circumvented both of those restraining factors. Hosni Mubarak realized this too late. He ordered the country’s Internet and mobile networks shut down of the second day of the protest. His secret police arrested the creator of the Facebook page. 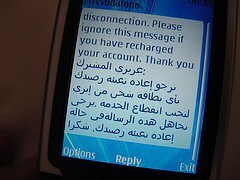 Mubarak wouldn’t have made those moves if the new communications technology was unimportant to his regime’s security. By the time he took those measures, however, the revolution was already on the streets. And the autocrats of the world took note; China, Russia and Turkey have all recently restricted these new communications technologies to attempt to control public dissidence. Malcolm Gladwell should stick to writing page turners like Outliers instead of misinterpreting current events in a region he has no academic background. Somehow I don’t think either of us is keeping him up nights. Amazon, on the other hand…..
Great article, Sam. Thanks for sharing. I’ll probably wind up using it in my dissertation! There is no such thing as too many secondary sources. Steve, I agree the technology was a catalyst and not a cause of Mubarak’s demise. The cause was oppression and lack of economic and civic opportunity for the largest nation in the Middle East. Obviously revolutions have succeeded in the past without tools like the Internet. But, this Egyptian revolution is far from won – Mohammed Morsi was unseated within a year of assuming the Presidency and now General Al Sisi, another Army strong man, is at the helm of Egypt. I am arguing that it was the young protestors who recognized that the Internet, social media, and smartphones offered a window to revolt where there had previously been none. That is not to say that the revolution succeeded. Nice job on this, Chris. Still, everyone from Jesus Christ to Sam Adams succeeded in stirring up major unrest without social media. I think social media was an accelerator in the Arab Spring. It would have happened regardless.